Dale Jr on Matt Kenseth via Dirty Mo Radio show. 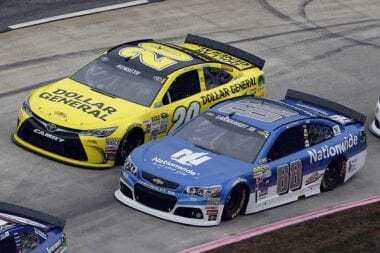 Dale Jr speaks on the apparent payback of Joey Logano at Martinsville Speedway on Sunday. Talk of the incident is dominating the talk around the NASCAR world. On the latest installment of “The Dale Jr. Download” on Dirty Mo Radio, Dale Earnhardt Jr. weighed in with his take. The genesis of the friction between Kenseth and Logano goes back to what happened in the closing laps at Kansas, where Logano turned a race-leading Kenseth to take the lead on Lap 263 (of a scheduled 267, although the race did end in a green-white-checkered finish, with Logano winning). This time, Kenseth, who was multiple laps down at Martinsville after an incident with Brad Keselowski and Kurt Busch on Lap 435, appeared to intentionally send race-leader Logano into the wall on Lap 454. “Everybody’s going to be talking about that mess with the 22 (Joey Logano) and the 20 (Matt Kenseth), so here’s my opinion on it,” Earnhardt Jr. said. “I thought the 22 was pretty aggressive at Kansas but what did him in, was kind of how he handled it afterwards. He said things that would piss off anyone that just got wrecked by him. I think what he said after the fact is what bothered Matt the most. Those comments from Dale Jr. about how Logano handled his Kansas move post-race echoed what Martinsville race winner Jeff Gordon told “The Dan Patrick Show” on Monday. Dale Jr. also thought the earlier incident with Keselowski, a driver that Kenseth has had some past run-ins with may have contributed to his frustration. For his race, Dale Jr. finished fourth but some mid-race contact with Gordon, his Hendrick Motorsports teammate left him a little miffed. “We played bumper tag with Jeff (Gordon) for a little bit. As soon as he caught me, he ran into the back of me. I let him know I didn’t like that too much. I waited for him to run into the next car he caught but he didn’t. I was kind of offended a little bit. Dale Jr. also had some hard racing with spring Martinsville winner Denny Hamlin in a battle for third place and the two-time winner in 2015 used that to explain his thoughts on moving drivers around. And if you are wondering who Dale Jr.’s championship allegiance is to, you don’t have to.